Our elegant Flower Girl Silver Personalized Picture Frames are a thoughtful gift to honor your adorable littlest helper. It's a fantastic way to show her your appreciation for standing by your side on your special day. Adding your favorite picture of you and the flower girl will be sure to hold all of the little girl's memories that she can look at years from now. Includes FREE personalization. Top of frame reads: Perfectly Picked Flower Girl. 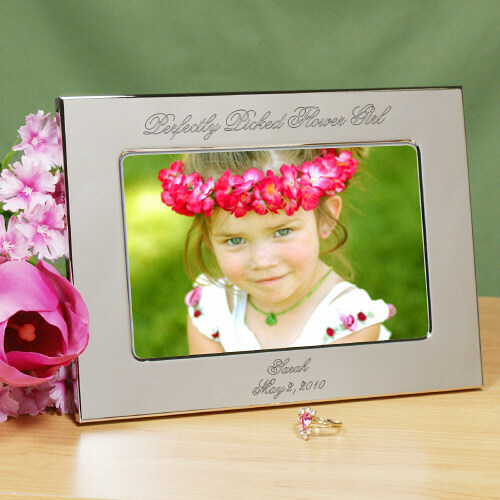 Engrave your Flower Girl Silver Customized Picture Frames with any Flower Girl's name and date. Measures 5 3/4" x 7 3/4"
I got the bridesmaid glass picture frames and they are so nice everyone loved them i would recommend these. The engraved words are a bit tough to read.